A whale watching tour is undoubtedly one of the highlights of a summer trip to Maine. Since our interest in sealife extends to those creatures that fly above the ocean’s surface, we booked the Puffins & Whales tour run by the Bar Harbor Whale Watch Company. Our 3.5 hour excursion promised a full survey of the cetacean and avian inhabitants of the frigid waters of Petit Manan National Wildlife Refuge. Unfortunately, puffins only came first in the name of the tour. Once we were on the water, they were a distant second in priority. What I’m trying to say, my major gripe here, is that the tour paid only token respect to the puffin perusal portion of the itinerary. We chased whales for a long time, getting crippling views of Humpback and Finback Whales, along with brief glimpses of Harbor Porpoise, Giant Bluefin Tuna, and Gray Seal. I still can’t believe how close we were to the massive sea mammals. Especially impressive was how the crew was able to identify each humpback by its tail pattern. Unfortunately, when it came time to admire alcids, we were given about five minutes to take in the panorama of Petit Manan Island, home to thousands of breeding birds. Worse yet, we were both much further from the island than I expected and had no option but to stare directly into the setting sun. Perhaps the crew miscalculated the time. Perhaps our position was the only one such a large vessel could take when approaching Petit Manan. Frankly, I don’t care. People interested in a Puffins & Whale tour deserve better than distant, backlit views of these prized birds. Now that I’ve gotten that off my chest, I can talk about the birds. We did, of course, spy plentiful Atlantic Puffins. Since everyone knows why these clowns of the sea with their spectacular colorful bills are so beloved, I’ll just say that it was wonderful to see them in their glory. 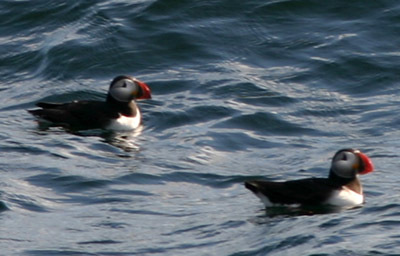 My photo makes it look as if we got closer to puffins than we actually did, but the birds are quite impressive in person. The puffins shared Petit Manan with plenty of guillemots and Common Eiders, along with a plethora of gulls and terns. The gull species were the ones already mentioned. The terns included breeding Common and Arctic, and one Roseate we managed to pick out of the whirling crowd. Since a whale watch is, by its very nature, a pelagic excursion, it comes as no surprise that we spotted a number of pelagic species. Amidst the gulls and terns turned up a wealth of shearwaters, mostly Greater with some Sooty thrown in. 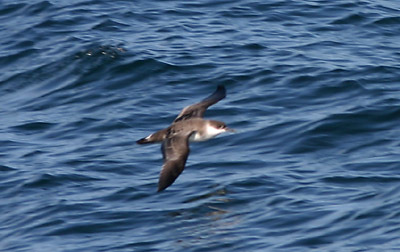 I also noted a number of storm-petrels fluttering like white-rumped bats along the ocean surface. I only picked out Wilson’s Storm-petrel, which is a shame since Leach’s were almost certainly there as well. I should have leaned more heavily on the ship’s excellent naturalist. Still, the aforementioned pelagics, three lovable life birds, along a single Red-necked Phalarope and always welcome Northern Gannet made for a decent day of seabirding on top of some breathtaking whale watching. I’m just chafed because it could have been so much better.